Group portrait of members of the 20th Battalion. These soldiers enlisted between July and August 1915 and trained in Egypt from December to April 1916. They were then sent to the Western Front. Standing, from left: 2362 Pte Charles Hendry Elliott, a labourer from Waverley, NSW, formerly of London, England. Pte Elliott returned to Australia in September 1918; 2926 Pte Eric Austin Tate, a farmer from Kangaroo Valley, NSW. He was promoted to sergeant in August 1917 and killed in action at Passchendaele, Belgium on 9 October 1917, aged 26. 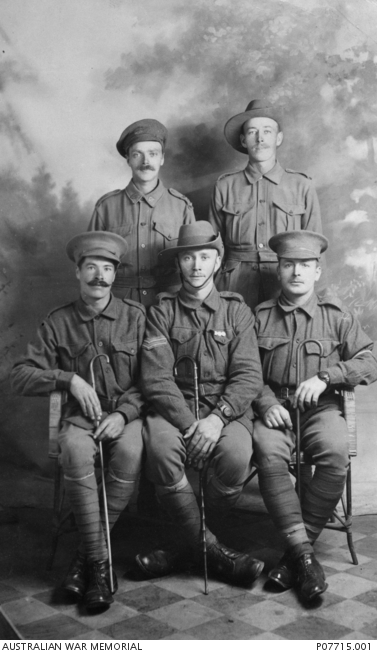 Sitting, from left: 2648 Pte Donald Davidson a labourer from Bullaworrie, NSW, formerly of Aberdeen, Scotland. He was promoted to corporal on 6 November 1916 and killed in action at Flers, France, on 15 November 1916, aged 25; 2822 Corporal Edmund Smith, a plasterer from Haberfield, NSW. He was killed in action at Bullecourt, France, on 2 May 1917,aged 24; 2777 Pte a butcher from Rozelle, NSW. Pte Prentice returned to Australia on 13 April 1919. Pte Tate wrote on the back of the photograph that the group were ‘tent mates’.